Before leaving the Necropolis we made one last stop at its edge: the Temple of Hatshepsut at Deir-el-Bahri. The architect created here an entirely new type of temple, because he wanted it to be integrated and rise with the cliff towering above it, a tremplin to the sky. 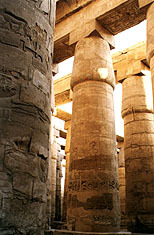 Moreover this structure establishes a privileged dialog with the Temple of Amon at Karnak, as it faces it across the Nile. 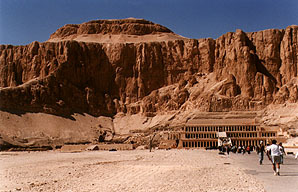 The Temple was not treated kindly after Hatshepsut's death. When her predecessor had passed away, the throne was supposed to go to her nephew Tuthmosis 2, but since he was too young, she was the regent. She crowned herself Pharaoh, and so her furious nephew had to wait for her death to become king. He then proceeded to wipe everything about her out of existence, hammering her effigies and removing her name from the royal lists. Her funerary temple was abandoned. Mercifully, we still have lots of representations of her, including the two wonderful friezes of her temple. The first one represents an expedition to the Punt: the Punt (Sudan) was considered the birth place of the Gods, and this journey was one of her great achievements. The representations of the indigenous people met by the expedition are amusing; the chief's wife in particular is depicted as ugly, humped and ungracious. The second frieze is amazing! 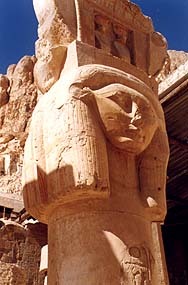 In order to legitimate her ascension to the throne, Hatshepsut had herself represented as the son of Amon. The frieze unfolds in a sequence of scenes, like a comic strip. 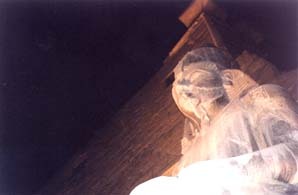 First, Amon is shown to marry Hatshepsut's mother. Their moment of intimacy is depicted with delicate symbolism: The man and the woman are shown seated face to face, with only their feet crossing; they present the Ankh to each other's mouth, "feeding each other life", and below their feet little deities are lifting them up, carrying them on the winds of ecstasy... Beautiful subtlety! 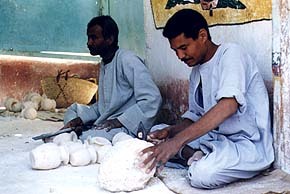 Amon then asks Khnum, the potter-God who fashions humans from clay, to make a son for him. We see Khnum creating Hatshepsut on his tour, along with "his" ka (spirit). Amon then presents his "son" to Thot, the scribe-God, who writes his name down and so makes "him" legitimate. The final scene is exceptional in a society where scenes of intimacy rarely appear in art: Amon cradling his son in his arms! This is a way to say that the God was so happy with his son that he cannot help but cuddle him in public. This is a portrait of Hatshepsut under the traits of Hathor, the Cow-Goddess of Love and Death (a peculiar combination unless you think like the Egyptians); it doesn't prevent her from being represented as Osiris on the upper storey. It was common practice to represent the queens as Hathor and the kings as Horus in life, then Osiris in death. We were pretty exhausted by this time, but the day was far from over. After a little detour to see how alabaster objects are made (the technique hasn't changed since Antiquity, although the quality of it has declined), we headed back to the East shore that we still had to visit before leaving on the boat. 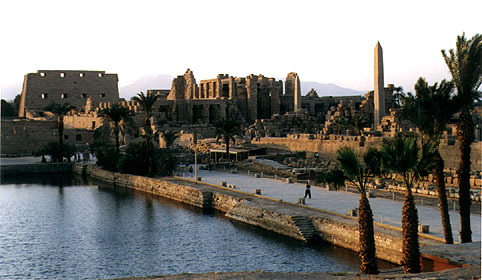 The temples of Karnak and Luxor awaited us. 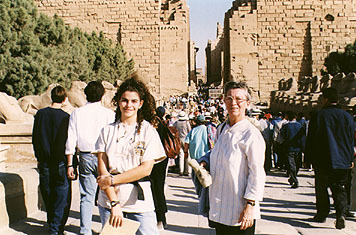 Mamie and I at the entrance of the Great Temple of Amon in Karnak. The Great Temple of Amon in Karnak is very impressive: the picture above was taken from the endpoint of the visit, at sunset, near the basin where priests cleansed themselves. 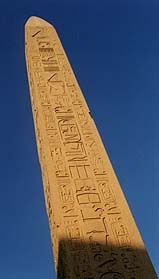 As for Hatshepsut, she was so determined to erect the largest obelisks of all times that when no room was found for them, she had the ceiling of a small cedar-wood hypostyle removed. I love the pink granite used for the obelisks. 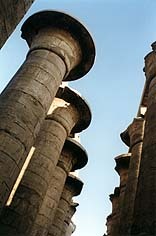 The hypostyle or "Hall of Many Columns" of Karnak is probably the most reknowned. Its massive columns built close together make it look very cluttered, but actually the scale is such that it is quite spacious. Most have capitals in the shape of closed papyrus buds, evoking the primordial swamp from which the world is believed to have started; however, along the processional axis, the papyrus buds are open. Axis, axis, axis. There was nothing more important in Egypt, whose existence relied on two axis as we saw earlier. The majority of temples had an axis that was perpendicular to the Nile, so that they would face the sacred river. A temple can be considered complete if it has a sanctuary and an axis leading from the Nile to it -- the rest are additions.The temple was built around the original shrine, which ended up being a small room at the heart of it. Progression within the temple goes from pylon, through the hypostyle hall and many rooms that decrease in size; the ground actually rises while the ceiling becomes lower until you are in the shrine/sanctuary, tiniest room of all. This hierarchy also corresponds to a sieving: how close you could get to the holy shrine depended on how high you stood in the social pyramid. Only the High Priest and the Pharaoh were allowed into the shrine, home of the God or Goddess of the Temple -- or at least of their effigy. Luxor, however, doesn't face the Nile: it lies parallel to it. 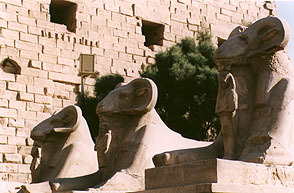 The reason for this very rare disposition is that it was developed in relationship to Karnak, to which it is linked by the avenue of these magnificent ram-headed sphinxes. 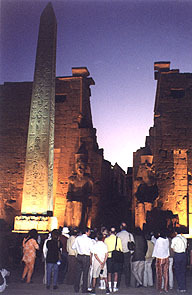 During processions, the Sunboat would be borne out of Karnak, down to the Temple of Luxor and back up to the former. The lights make this colossus looks ghostly but also ethereal, virtually weightless, is smile even more quizzical. "I know a secret", seem to say all the statues of Ancient Egypt.